DIY hardware is all the rage these days (see the Make:blog), but how about DIY software for music? An increasing number of free and commercial tools on every platform makes it possible to create wild, custom software configurations for real-time music and video without code — or cash. OS X Tiger users have access to Quartz Composer, which just got its own blog, and Mac, Linux, and Windows users have Pd. Mac users again get a little edge here: you can create Aqua-friendly apps that connect to Pd using Paradiddle (which means you could easily use your soft gadgets in conjunction with Ableton Live or even Max/MSP), plus a nifty set of Linux/Mac image processing and motion tracking externals called PiDiP. Want more? Why, there’s even a tutorial in Japanese. And I think Jim will have some follow-ups at O’Reilly, so stay tuned. With new releases of Max, Reaktor, and Flash, I look forward to an open source AND commercial DIY multimedia software bonanza. 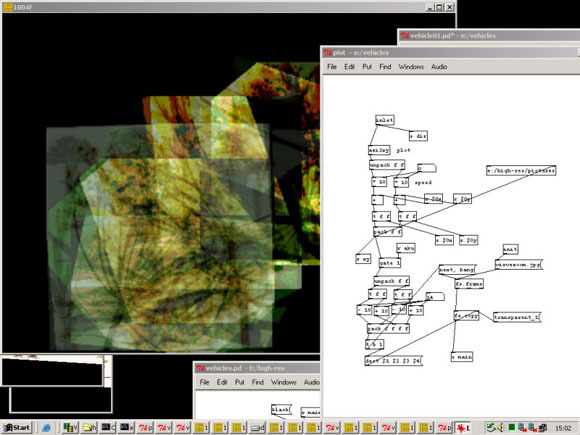 (Don’t forget the superb Max/MSP add-on Tap.Tools, covered earlier!) Where’s my Mountain Dew?